Lent is a word that means Springtime. This important season in the Church year is a time of change, growth and spiritual depth. This series is based on “Year C” in the liturgical calendar. The readings are from the Gospel of Luke and his great themes of prayer, joy, and God’s mercy. In order to change, we don’t need grit, we need grace. Experience new life and revolution as you listen to these episodes. God said Caleb had a “different Spirit.” Following Jesus is a break from the norm. You are not like the rest of the world, average, negative and mediocre. You have an excellent spirit and a destiny to fulfill. As you live with passion and work at your potential, you will influence and impact others. You have been “called out” of darkness to proclaim God’s marvelous works. Because God is with you, victory is in your future! Addictions to any type of substance cut across all gender, racial and denominational lines. The 12 Step program provides a tested and true way to lasting recovery. In this important series Fr. 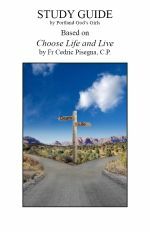 Cedric explains about the 12 Step program and how it can help a person come to sobriety and find God. Specifically, the AA and Al-Anon programs will be highlighted. These episodes cover all addictions however. The only requirement to become a member of AA is the desire to stop drinking. The 12 Step program has also helped multitudes to find God. Many people struggle with their prayer life. They aren’t sure if they are praying correctly or effectively. The Catholic Catechism calls this the Battle of Prayer. In this important series Fr. 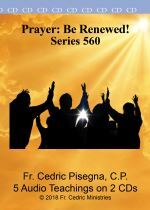 Cedric Pisegna, C.P., a Passionist priest and missionary, teaches about how to be renewed and rejuvenated in your prayer life. He will share about how to be heard by God as well as how to hear God in your daily life. Prayer is our lifeblood as Catholic Christians. 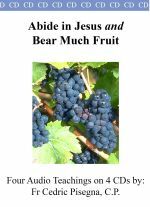 Be inspired and learn how to abide in Jesus Christ and bear abundant fruit. When David was anointed, God’s Spirit “rushed” upon him. A rush is when something happens quickly and abundantly. Grace is God’s initiative and power to help us in our time of need. God has the might and ability to strengthen us and empower us to meet any adversity, trial or hardship. In addition, God’s grace comes with creative and innovative power to help us dream dreams and achieve them. As a believer, you can expect a “rush of grace” right when and where you need it most! Jesus promised to be “with” us. His name is Emmanuel which translated means, “God is with us.” Because God is with us we can have our mind renewed and think God’s positive thoughts. Hope isn’t “false” but “alive” because of God’s presence. We can change and overcome any bad habit or recover from any addiction. Our prayer life will be revolutionized as we come to know God’s love through the Holy Spirit living within us. Once we understand and appreciate the truth that God is with us, life will be totally different. Joy is an inner assurance of God’s presence within our hearts. God’s presence leads to exuberance, delight and happiness. These feelings can fortify and strengthen us even when we face problems, trials, and hard circumstances. Real life dictates that loved ones will die. In the midst of all these, we have the blessed assurance of God’s lasting presence. God will never fail or forsake us. Not even death can separate God’s passionate love for us. Because God is with us we can be happy, experience personal change, and accomplish dreams. With God all things are possible! Lent is a season of Grace. We journey towards Easter in a pilgrimage of change, growth, and transformation. We change not so much by resolution as by an inner Spirit-led revolution. In this Lenten mission you will accompany Jesus into the desert to the mountaintop. You will get a glimpse of glory so that you will realize how deeply you are loved and be fortified to persevere in prayer and face your own trials and tribulations. You will realize your sufferings have meaning. God is purifying you in your sufferings and dark times. Through Jesus’ passion you will experience redemption and forgiveness. 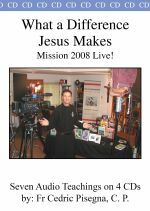 Experience the power and grace of a made-for-television Passionist Lenten mission! God loves you. When you follow Jesus you will come to know him personally. As you have faith in God you will see doors open and amazing things happen. Everything in your life will fit together and work for good. Included in this series is Fr. 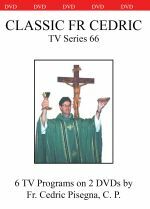 Cedric’s Christmas program as well as three episodes that aired on the Catholic network EWTN. Passion is energy. God gives us energy to live beyond the ordinary. Because of the Holy Spirit, you can live a life of inner joy and glow with enthusiasm. 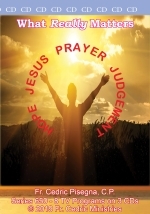 In this important series, you will learn about prayer and how to listen to God. You will sense God’s touch in the everyday events of life. Hope will inspire you and motivate you to celebrate life. No matter the circumstances and sufferings you encounter, you can be better instead of bitter. Jesus offers us a whole new way to live. Don’t just live, live with Passion! We all need a manifestation of God’s grace in our life to achieve the fullness of our destiny. God has a plan for your life and viewing this series will help you to receive the grace you need to walk in the fullness of God’s will for you. This is your time. Jesus is passing by. Awaken to his voice. Overcome any setbacks and be resilient. Spend time in silence, be rejuvenated and nourish your inner life. God is speaking and will guide you. Receive your Big Break and be all you can be! I invite you to pray the Rosary with me. These two CD's contain all four mysteries of the rosary including the Luminous mystery. You will be delighted when you hear how prayerful this recording is. The background music will further enhance your prayer experience. God will bless you as you meditate on the mysteries of Christ through the rosary. Available in CD only. Everyone has storms in life. These sufferings, adversities, trials and difficulties aren’t meant to break us, but to make us. Troubles and problems can actually catapult you to new levels of character and depths with God. Darkness isn’t meant to defeat you but bring you explosive growth. Like the seed, when you remain faithful and patient, you will see God doing a wonderful work of grace in your life. Disciples of Jesus are victors in life. No matter the danger we are kept by God because we are loved. We are shown mercy because God is so gracious. We can hear from God because God wants to direct our life. During this series you will awaken to a greater sense of God’s presence which will help you to live with enthusiasm and passion. Even though there are difficulties that all must go through you can turn your scars into stars and be more than conquerors no matter the trial! This mission was filmed at Immaculate Conception Church in Sealy, TX. (60 miles West of Houston) These programs are being aired nationally and internationally on the Trinity Broadcasting Network (TBN) as well as many other stations in various cities. Being positive in every area of your life opens the door for God to work. God’s love is revealed to us in many different ways. God comes to us in creation and people as well as through his Holy Spirit. This series will help you to receive and experience God’s love. As you listen to this series you will learn how to hear the voice of God, be positive, and know God’s goodness even where there are trials and sufferings. God is always for us and never against us. Because of God’s love, we are more than conquerors through Christ. We are more than conquerors through Christ who loves us. Because of Christ’s love we can not only face the multitude of challenges that come our way in life, but they can even catapult us to greater heights. Learn how to live life with a “can do” attitude and allow your problems to promote you. Jesus give a peace and a joy that no storm can take away. When we press past our difficulties and focus on what lies before us we will make progress. Knowing Jesus in a personal way will help us to progress and develop in every area of our life. This series include 7 episodes of the TV series “Live with Passion!” Included are: 	Challenges make Champions 	Forget what lies behind and press forward 	Peace is your gift 	Come to know Jesus in a personal way 	Be filled with the Holy Spirit Through God’s love you can face any difficulty and become a champion. Turn your scars into stars! God’s love is revealed to us in many different ways. God comes to us in creation and people as well as through his Holy Spirit. This series will help you to receive and experience God’s love. As you listen to this series, you will learn how to hear the voice of God, be positive, and know God’s goodness even where there are trials and sufferings. God is always for us and never against us. Because of God’s love, we are more than conquerors through Christ. In 2013 we celebrate a "Year of Faith" in our Church. Faith starts as small as a tiny seed, but can grow and become all that you are. It is the gift of your faith that will bring you through any difficulty and open the door for an overflow of grace in your life. These talks and interviews by Fr. 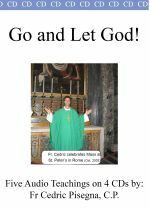 Cedric and John Michael Talbot will inspire you and ignite your faith! The Scriptures tell us that Faith lasts forever. As you watch these teachings, you will experience the blessings that faith brings. Don't walk by feelings and sight, walk by faith! 1 Peter 1:3 tells us that we are reborn to a "living" hope. Hope isn't simply a virtue for the hereafter. Hope is for the here and now. Hope believes God is at work for good in our everyday life. God's great plan is to mold and shape us into the image of Jesus Christ. Through our sufferings, joys, and life experiences, God will transform us into the image of his Son. Because we have a living hope, we know we can hear from God. In hope, we were saved by the cross. Hope believes that our young people have a glorious destiny. The Holy Spirit is the beginning of what is to come and is already at work in our heart. The Bible says that hope lasts forever! Be a person who understands and walks in hope. Hope is alive! God is at work in us. Discover God's purpose for your life in this grace-filled series. As believers we are invited to follow Jesus. He lived with exuberance and celebrated life. In this 12 part series, Father Cedric teaches about Passion during the annual St. Ann Novena in Scranton, PA. He also shares about many everyday topics. This series is being aired nationally and internationally on the Church Channel. Watch/listen and be filled with Passion for Jesus! These teachings will help you to live a Passionate Life of prayer, surrender, and life in the Holy Spirit. Expect to move forward towards God's will for your life in ways you never have! These mission talks will touch your heart and help you to "Live with Passion!" Recorded live at St. Luke's Church in San Antonio, experience what the several hundred who attended his mission did: a renewed energy to live for God. These 7 talks on 4 CD's were recorded live in 2008 in Houston (Pearland), TX. (These are the same talks as on the DVD's Series III with slightly different names) Jesus can make a difference in every area of our life. In these dynamic talks, Fr. Cedric will proclaim that Jesus can affect our attitude, thoughts and spiritual life through his grace at work in us. Learn about the power of Grace. Realize that your storms were meant to help you grow. What a difference Jesus makes! These teachings were recorded in studio, not live. These will help you to be filled with God's Spirit. 1: Be Filled With the Holy Spirit 2: Hearing God's Voice 3: Resurrection Choices 4: You Can Make a Difference! These teachings were recorded in studio, not live. They will help you to learn and follow Jesus. 1: Seize the Day! 2: Self Acceptance Through God's Love; How to Live in Contentment 3: The Journey; Forgive & Live 4: Be Renewed In Your Mind; Take Your Keys & Use Them!